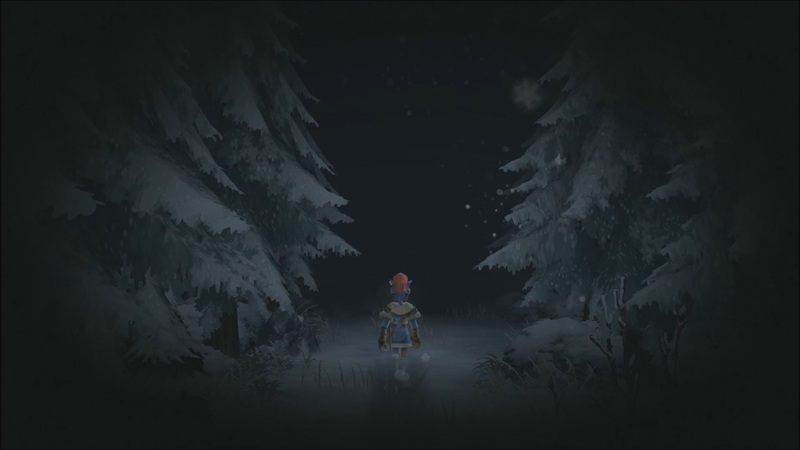 I AM SETSUNA has big shoes to fill. Newly-minted studio Tokyo RPG Factory are a big fan of the classics — going so far as to proudly proclaim that they’d love to return to a bygone era of Japanese-style role-playing games. Well, you don’t get more classic than Chrono Trigger, Squaresoft’s masterstroke from the 16-bit era that accrued a metric ton of accolades an insatiable hunger for more – even after quasi-sequel Chrono Cross, ephemeral Chrono Break, and a modest remaster for the Nintendo DS. Some even outside of the Square Enix ecosystem have even developed their own homages to a highly formative title for many in an older generation of RPG fans. Tokyo RPG Factory isn’t the first to jump on the throwback train. I Am Setsuna is to Chrono Trigger is what Silicon Studio’s Bravely Default is to Final Fantasy V. Of the genre’s emerging trends, Setsuna falls under “what’s old is new again”, accompanied by “catching up to the West”, or “double down on Otaku”. Whatever stigma you attach to each is a conversation fit for another day; the important takeaway question here is whether Setsuna is a fitting homage and is also able to set its own image. …Or does it matter? The game starts with the player assuming the role of protagonist Endir, a man who hails from a clandestine tribe of mercenaries. While on a mission, which serves as the game’s opening and tutorial, Endir crosses paths with a mysterious man who offers him a new job. On an island in the north, there is a young woman who has chosen to be the next sacrifice. Endir’s job is to kill her. He sets off, eventually encountering Setsuna, his target. He draws his sword. Bargaining for her life, Setsuna tells Endir the role of the sacrifice. She, with her guard, are to travel to the Last Lands where she will offer up her life to staunch the monster hordes from wiping out what little of humanity remains. This has been necessary for many generations, and Setsuna convinces Endir that if he must kill her, he might as well accompany her until her until her world-saving sacrifice has been made. From here, the journey begins. They eventually gain the company of Aeterna, an enigmatic dagger-wielding time mage, Nidr, a world-weary swordsman, Kir, a spunky rare-blood adept in fire magic, and Julienne, a noble knight hiding a dark secret. These are six of seven recruitable characters to your party. We’ll keep the last one a secret, but Chrono Trigger faithful will know early on. I’m glad Setsuna creates a lot of genuine conflict with the playable cast, as it really brings out each character’s personality, even if they’re not the freshest thing on the block. I kept thinking back to my recent playthrough of Star Ocean: Integrity and Faithlessness and felt that everyone was just a little too chummy, and what tension was introduced between the cast was dissolved within minutes. Anyone familiar with Final Fantasy X’s story shouldn’t be blamed if it smacks as familiar, but you’ll grow attached to these characters over the 20-30 hour scenario. There are some predictable tropes that play out, but none of it is every offensive. Yes, Setsuna’s run-time is shorter than usual JRPG fare, but that’s a good thing here. It eschews the “final act drag” many 40 hour campaigns feel are essential and remains on a great pace the whole way through. Endir, as a silent protagonist also gets ample opportunities to choose dialogue options so that he doesn’t feel segregated from the goings-on. Setsuna doesn’t linger overlong. Just know that there’s plenty of endgame challenges (boss rush dungeons) that will require you to spend more intimate hours with the battle ecosystem. Since this is a spoiler free review, I’ll just note that I enjoyed the ending, and I’m curious to hear the thoughts of others in the coming days. We’ll save that chat for later. What really sets the tone around a story of sacrifice is an endless winterscape and a soundtrack composed entirely of piano arrangements. It’s an interesting choice given that many JRPGs offer many different styles of music and locations. This’ll undoubtedly put off a few people, but I really loved that they stuck with this through the game’s entirety – and I speak from simple, selfish opinion. I live in a place where it’s winter outside a lot. Also, to be quite frank, I’m a little tired of the genre shoehorning in “obligatory desert place” or “obligatory jungle place”. More imagination here would work wonders, you games with higher budgets. I love how the brutal cold of the game’s wilderness contrasts with the small, huddled warmth the last vestiges of humanity have coalesced set to a somber, solo pianist. Battle themes add percussion and strings, but only to support the piano’s firm, everpresent grip on the melody. You may get tired of it, but I didn’t. The soundtrack hits all the right keys. I mentioned before in a preview of the Japanese version – of the many definitions of the Japanese word “setsuna” it feels that this story and setting is its embodiment. We may not have a perfect word for it English, but you’ll come to understand and appreciate it as you play through to the end. The only complaint on this front is the lack of variety within the great setting – there are several dungeons in the campaign that look the exact same, and more variety here would have been perfect. It’s nothing too glaring, and a small budget is a small budget, but something I think folks will point out as a flaw nonetheless. Let’s talk combat. The base here is pretty much Chrono Trigger, in which actions are governed by the Active Time Battle (ATB) system. When the ATB meter fills, you can act — attack, use skills, or use items. What Setsuna adds is a new gauge that functions as a linchpin for the game’s special twists on an old formula. When you let a character’s ATB bar fill to maximum and take no action, or take/dish damage, the Setsuna gauge will slowly fill with SP. Once full, a node will appear on the gauge. This node can be used to modify your attacks and skills via a timed button press. For example: basic attacks can be made to add an additional hit, healing spells can be made to cure status ailments, or single target abilities will gain area range. Think Squall’s gunblade mechanic in Final Fantasy VIII only that it works for just about everything sans items. Spritnite stones comprise all of the game’s battle skills and passive traits. Depending on the Talisman you have equipped to a character (and taking your current level into account) you’ll be able to equip a certain amount of Spritnites. What makes this interesting is that your Talisman (think “Accessory”) will bestow special traits on your techs as you use the Setsuna gauge in battle. These count as passive bonuses and can be used to create the same Tech but with different modifiers – such as increased potency or the chance to increase critical hit rate. Loot you accumulate from executing various types of “kills” will be the fodder with which you create your Spritnites and adds another flavor to combat that will push you to experiment with a wide array of abilities. You’ll need to do some research into what types of Kills will drop certain components if you want to collect the best stuff. While you won’t have to dive too deep into the system for the campaign, many of the post-game challenges including difficult “spritnite-eaten” encounters will push you to hone your spritnite techs to adapt to various mechanics. Minor gripe, carry some Fogstones in your inventory as the game will drop these near-impossible encounters at the end of certain dungeons. If you get a game over here, it’s back to the title/save screen with you. If it happened to me, it can happen to you. The game suffers a bit with multitude of similar-ish enemies which, aside from bosses or spritnite-eaten monsters, don’t have much to contend with mechanics-wise. Anyway, it was quite fun to play around with it all, and I’m curious to see what powerful combinations I can come up with in the future. I think if you’ve come off of Chrono Trigger, there’s enough to finagle with to keep you interested, all while keeping it comfortably familiar. There’s nothing by way of mini-games or non-combat-based sidequests sadly — extra quests to explore the world’s lore would have been nice. I spent a lot of time thinking about how this game compares to Chrono Trigger, and the more I thought about it, the more I didn’t want to think about it. 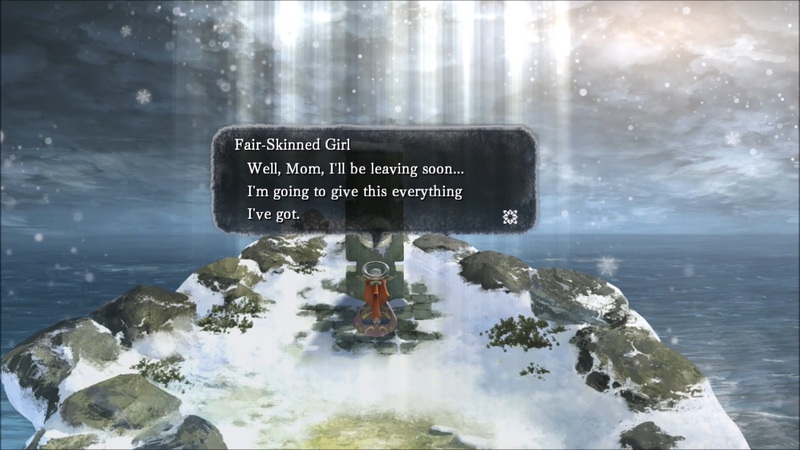 I really liked I Am Setsuna for what it is, and perhaps more than what other critics and fans will. A lot of that is due to how the story and presentation struck me; it endeared the characters and colored the setting – and I’ll admit I was near misty-eyed when the credits rolled. If you want me to answer that inevitable question: “is it as good or better than Chrono Trigger“, I’m afraid it’s something I just can’t. I didn’t think about it too much as my time with the game went on – it seemed to blend into the periphery of my thoughts. Many of our favorite nostalgic experiences carry a special meaning only we can individually define, so who am I to judge? What I do know is that I think what’s here stands as a fine and fond remembrance by fans, for fans. Whatever angle you come in at, I think you’ll find something to enjoy in I Am Setsuna. I Am Setsuna is now available for PlayStation 4 and Steam for $39.99. Disclaimer: A review copy of I Am Setsuna (PS4) was provided to Nova Crystallis by Square Enix, the publisher. The advertisement(s) below benefit Nova Crystallis. Posted in Headlines, I Am Setsuna, Reviews. I think it would benefit the review to put a final list of pros and cons to summarize your thoughts. I’m not saying to give it some number review, as I don’t really feel like a metric like that holds any value. Great review. I just installed the game, can’t wait to play it. I’m also not gonna constantly compare it to Chrono Trigger. This game is its own entity. Also I feel the CT comparisons are a bit unwarranted. Yeah they share very similar battle systems, but are they remotely the same in plot, thematic content, character types, time travel, etc? It sure doesn’t look like it. CT’s main theme was time travel to save the world from an inevitable threat, whereas IAS is apparently about sorrow and sacrifice. Also, I totally know what you mean about obligatory area types, I’m kind of tired of it in RPGs. For example, Tales of Zestiria has the most generic types of places you can think of. Obligatory desert, canyon, swamp, forest, plains, snow caves, and of course, 4 elemental temples. And it’s all just filled with enemies and chests lol. Well anyway, I’m glad to see IAS is faring better than Star Ocean when it comes to metacritic, reception is a lot more positive. Maybe if they do a sequel they can add in all the side content they didn’t for this one. I’ll try the game on payday but it’s not a priority. Seems good, but nothing incredible. But I still hope it opens the door for more RPGs that are still turn-based. I don’t wanna hate on this game since I’m playing it and enjoying it myself, but the number of flaws in it are way too many to count. First of all, these graphics have no business being on a PS4. You’ve heard of Mobius FF, right? Heaps and bounds better graphics! This is like, PSX level graphics, even less. Then, the battle system. This battle system makes me realize how much of a great move SQEX are making with leaving behind the ATB system for XV and future iterations. Mindless waiting for bars to fill up and fighting the same opponents, time after time… It’s so DULL! Next, the world. No variety whatsoever, just snowy field after snowy field (though that can be a bit of a good thing since not every game needs a desert and a futuristic city and a tropical location and a medieval castle). Then, the sound. Everything on one organ, no voice acting, no nothing… They do realize this is 2016, right? I’m not complaining, I’m just making a criticism of this game. These types of RPG’s don’t belong in this day and age and it seems weird and dated. If they HAD to release it, they should’ve made it a portable game for PS Vita or iOS/Android devices.